Whether your dental needs are a complete exam and cleaning, a full-mouth restoration, or anything in between, we promise to provide you with exceptional care as we enhance the natural beauty of your smile. Below are just some of the many pieces of technology we regularly use to treat our patients– with a gentle touch, and stunning results. CEREC: unlike typical restorations, which require you to wear a temporary crown and return for a second appointment, CEREC restorations are created the same day, right in our practice. Color matched metal free and highly durable, CEREC delivers the results you need in a single appointment, weather you need a full crown or a partial crown. PANO: Panoramic radiography, also called panoramic x-ray, is a two-dimensional (2-D) dental x-ray examination that captures the entire mouth in a single image, including the teeth, upper and lower jaws, surrounding structures and tissues. It provides increased detail of the teeth and surrounding bones. Glycine Powder Air Polish: glycine powder polish has recently become the most effective treatment for management and treatment of periodontal disease, maintenance of dental implants, and disruption of cavity causing bacteria. The air polishing technology replaces traditional pumice, and allows for plaque and bacteria removal without the potential harmful abrasive nature of traditional polishing pastes. Dental Diode Laser: the diode laser plays a very beneficial role in management of soft tissue. Such procedures include treatment of apthus ulcers, canker sores, herpetic ulcers, uncovering un-erupted teeth, contouring of the gums, and promotion of periodontal health. 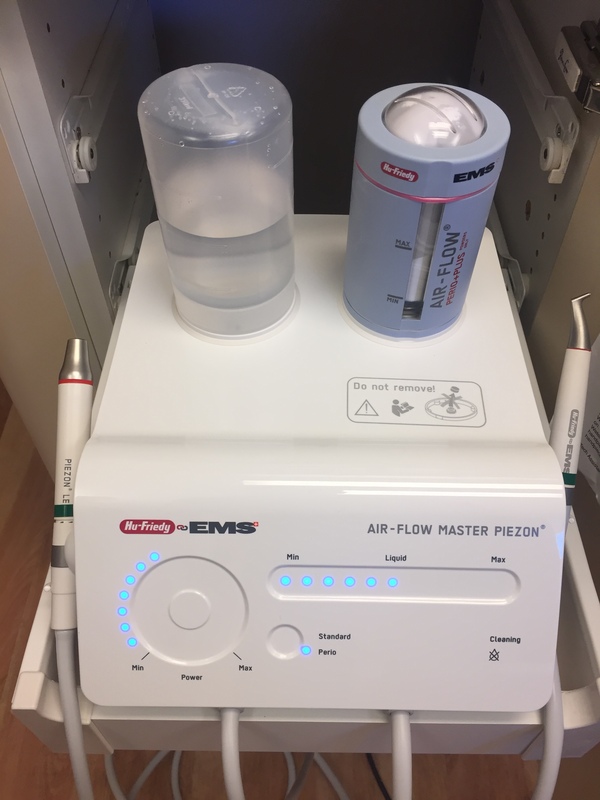 Diagnodent: this device allows us to scan patients’ teeth with harmless laser light for early detection of hidden cavities. Even very small lesions can be detected in the earliest stages. This enables us to treat cavities earlier, allowing for better outcomes and minimally invasive dentistry. CariVu- Caries Detection Device. CariVu is a compact, portable cavity detection device that uses transillumination technology to support the identification of cavities and cracks in teeth. Paperless forms: we take pride in being a paperless office (as paperless as a dental office can be). We manage all patient charts, procedural notes and medical histories electronically. This allows for quick access to your health care data, all while saving the environment.